There are two times that grass seeding is successful--late summer and early fall, says Sandra Mason of the University of Illinois Extension. Early fall planting allows the grass time to develop a healthy root system before winter weather rides in. Planting in the fall also ensures that young, weak grass is not burned out by the hot sun. Also to the seed's advantage is that in fall many weeds have lived their life cycles, so there is little competition for resources. Prepare the seed bed by removing obstructions such as trash and large rocks. Apply herbicide to the soil to kill any weeds, says Washington State University Extension. Do not plant seeds until the herbicide is allowed enough time to wear off according to label instructions. Spread 2 or 3 cubic yards of peat or other organic material per 1,000 square feet over the lawn, says the University of Minnesota Extension. Till the seed bed area down to a depth of 6 to 8 inches to mix in the material. Apply seed to the lawn using a seed drill set to a depth of 1/4 to 1/2 inch at the distribution rate required for the chosen seed. Walk the seed drill across the lawn, slightly overlapping the wheel marks from the last pass to ensure the best coverage. Grass varieties differ in how many pounds are required per 1,000 square feet. Check your variety for the application rate required. 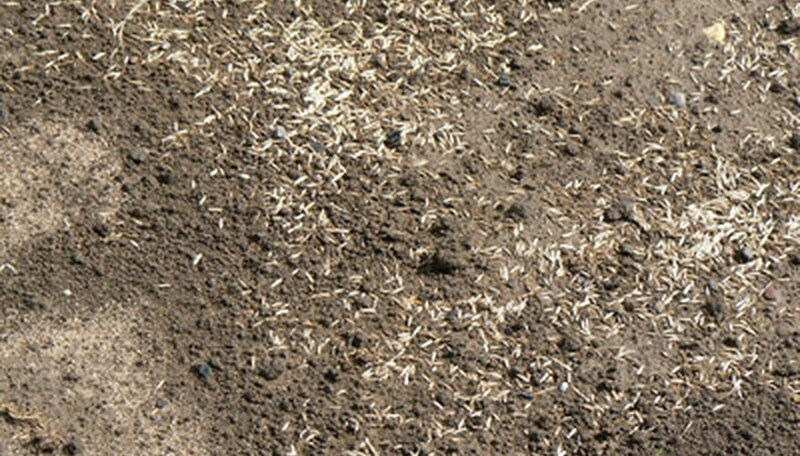 Spread a 1-inch layer of straw over the lawn to protect the grass seed from birds. Water the lawn thoroughly so the top inch of soil is moist. Water twice daily until the seed germinates, which is usually between 10 to 15 days. Decrease watering to twice a week, watering deeper so the lawn receives an inch of water per week. Mow the lawn once it reaches 3.5 inches in height and remove one1/3 of the leaf blade to encourage dense growth.